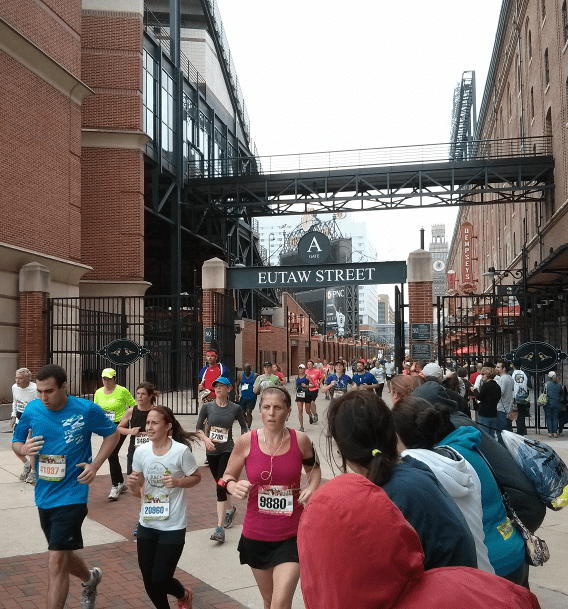 Race Report: Baltimore Running Festival Half Marathon - Run. Bike. Code. 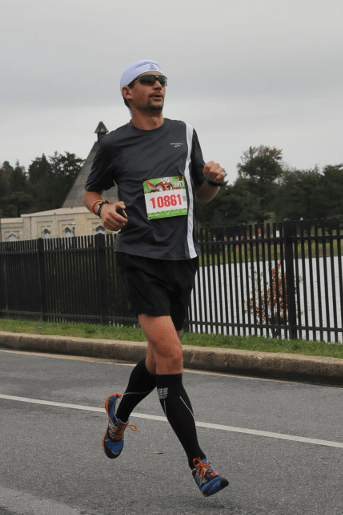 During my yearly “visit-the-US-and-watch-a-football-game” excursion this year I ran my first half-marathon on American soil at the Baltimore running festival. I was nervous in the beginning how it would turn out (everything from “if my flight is late I won’t be able to pick up my race packet and thus instead cheer on runners” via “this could be really great” to “if I feel crappy I’ll run slowly and enjoy the scene”), but it turned out really well. Here is the full recap. My itinerary to get to Baltimore was MUC → PHL → BWI, leaving Munich at around 12pm (CEST) and arriving in Baltimore at around 6.40pm (EDT). 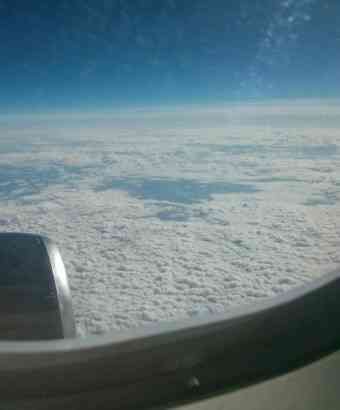 The flight was uneventful, to say the least. I was able to get a good two hours of sleep, simulating a CEST afternoon nap and ensuring I would be able to hold out long enough in the evening to adjust properly to eastern time. In order to keep the fatigue on the legs to a minimum I changed into my CEP Recovery Socks for the most part of the flight (highly recommended!) and actually only took them off right before bed-time in the hotel.My initial worries of delayed flights and a missed connection were unnecessary, everything worked out like a charm and we even landed a few minutes early in Baltimore – greeted by pouring rain. That was very much in line with the forecast, but I still had hoped for some dry weather. Since it was only a quick hop with the Light Rail from the airport to downtown Baltimore, I had enough time to check into my hotel, refresh myself and walk over to the convention center where the race expo was held1. As this was the last hour of the expo most people had already gotten their stuff so the lines were really short and I got my race bib, t-shirt and freebies in no time. I was very glad that my bib-number (10861) meant I would start in the first of five corrals, each holding about 2000 runners. According to the organizers the corrals would be started with three minutes in between. Shouldn’t be too crowded, then. The expo was surprisingly small and since I hadn’t planned on buying anything I didn’t spend too much time walking around. My feet would thank me later! After a quick bite to eat in the hotelbar I prepared my race stuff and hit the sack. Despite waking up twice during the night I had some good 7 hours of sleep and had no trouble of getting up at 6.30am. Start time for the half-marathon was 9.45am so I figured breakfast at 7am would give me enough time to prepare and walk over to the start area (the half-marathon start was different from the marathon start and actually closer to my hotel. Win!). The weather had dried up and it was overcast, with temperatures around 15-18° C. Perfect running weather. I had a very relaxed breakfast in the hotel (eggs & bacon, fruits, yoghurt) and was back in my room well in time to dress up while watching the 8am marathon start on the local TV station, complete with aerial coverage and live interviews. Somehow though I totally missed this awesome side story: The marathon was started by a Boston Bombing Survivor! The recommendation in the runners handbook was to arrive 90 minutes early (for security reasons) so I left the hotel at 8.15am, way too early as it turned out. Only very few half-marathoners were lining up and the position of the starting corrals was not obvious at this time. I wasn’t worried though and took my time warming up with a 20 minute easy run along the marathon course2, cheering for the wheelchair marathoners, who had a 5 minute head start to the rest of the field. Without further ado and a 10 second countdown3 the race was on and I found myself running and surprisingly not getting passed as often as I had thought. This made finding my rhythm very easy and I settled for a nice 7’10”-7’20”/mi pace. Compared to my last half-marathon this was certainly faster, but didn’t feel harder by any means, so why not go with it, I figured. For the first 2.5 miles the half-marathon course was separate from the marathon course and this allowed the first wave of 2000 runners to spread even more. Turning left on Linwood Ave. the two courses would merge, indicated by a big banner reading “Merge Mile”. I thought this was really well done (I’ve heard others comment that it created lots of problems, maybe in the later waves? 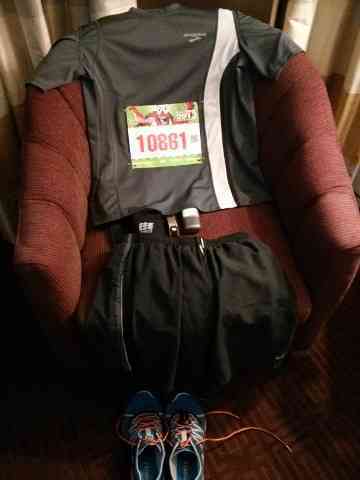 ), and from that moment on one had to look at the bib of other runners to see if they were competitors. Apart from the hilly sections (miles 4 and 6) I managed to run a solid 7’10”/mi. and felt good all the time. I made a distinct effort to speed up after the first 5 miles, and while it might not show in the lap splits, I’m sure that it was worth the effort to go up the hills. The stretch up to the turn-around at Montebello Park was tough, but the crowd gave great support (even though many lied by yelling “it’s all downhill from here” – that part was only true if you merely looked from the highest elevation point of view). After turning towards Lake Montebello we had a very welcome two miles flat-as-pancake before tackling our way up E 33rd Street (no coincidence that this is also a Strava segment). From there it was really pretty much all downhill, making the last 3 miles go by really fast (I even managed two sub-7 miles (6’50” for mile 11 and 6’46” for mile 13). Close to the finish line I was passed by a girl whom I had passed earlier and she encouraged me to go harder by telling me “this is the fun part!”. True, it was great coming down Eutaw Street and turning into Camden Yards. I was really surprised by the number of spectators who were cheering us on. My last half mile was close to 6’/mi, a speed that I wouldn’t even run during mile repeats in training! The clock ticked towards 1h35’ while I ran the final meters and with the help of all the people around me I was able to get the extra push to let me finish with a new (huge!) PR of 1h34’38”. 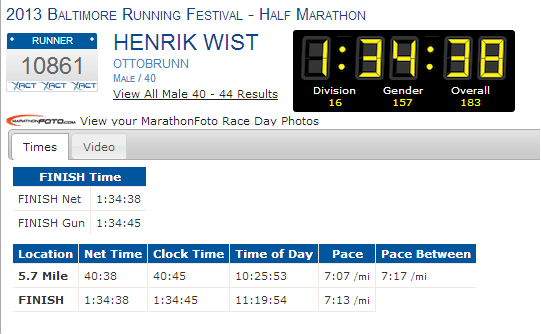 So within three weeks I shaved another five minutes off of my half-marathon time. 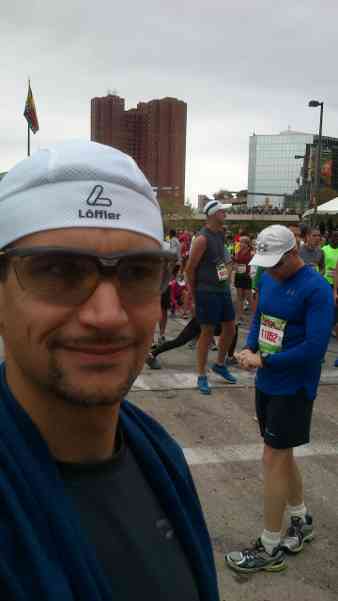 Out of 9682 finishers for the Baltimore running festival half-marathon I came in as 183rd overall, 157th male and 16th in the M40 age group. Talk about a happy camper! I found the finish area to be well organized, I had my finisher medal, space blanket and first bottle of water in no time, thanks to the many volunteers who took care of us. Also, the food choices were good and plenty! I took my time to recover and – since I didn’t have any bag checked – made my way slowly back to the hotel. As I had negotiated a late checkout I was able to get a relaxing shower, change into fresh clothes and walk back to the finish area to enjoy the celebration. On the way back I took some time cheer on fellow runners, half-, relay- and full-marathoners alike, who were still coming in in large numbers. After that, I meandered through the celebration village, which offered a wide selection of merchandise, food, and of course beer. Even though it rained for a bit while I was there, the atmosphere was super relaxed and everyone seemed to have a good time. I certainly did! I even splurged and got my finisher medal engraved. Gotta keep the memory! I can tell you, it was difficult for me to remember everything I saw and noticed before, during and after the race. So this list is by no means complete, but a few things stuck out. For one, if you want to get extra cheers, just run with a smile on your face. Spectators seem to love smiling runners and I got complimented a lot for it. As a side benefit, smiling relaxes your body and also gives you a positive attitude, which helps to avoid mental and physical struggles. And boy, did I have reasons to smile! As usual, there were many, many signs on the side. Some highlights included ‘Chuck Norris never ran a marathon’ and ‘May the course be with you’ plus many more that made fun of the then-shutdown U.S. government. And of course there were lots of kids handing free side-fives, gummy-bears and cute cheers. Gotta love it! Overall, I had a blast, and I’m sure I would have had a blast even without running a PR. The race was fun all around. I would certainly run it again, but the chances for me being in Baltimore around the same time next year are rather small. But if the stars line up sometime in the future, count me in! Try to get accommodation close to the starting line. It makes life so much easier before and after a race! Get nutrition and hydration taken care of before the race, so that I can run through aid-stations without stopping. Run negative splits, in particular for a half-marathon, split the race into 5mi/5mi/5k, with increasing effort. Be confident to line up as far in the front as reasonable possible. I can run a fast first mile and then back off a bit and with that I can avoid a lot of initial traffic. With that, my running season comes to an end. I’m taking two or three weeks off of running in order to relax and regenerate. I’m looking forward to next season, where I plan to run three or four half-marathons, with the long term goal of starting (and finishing!) 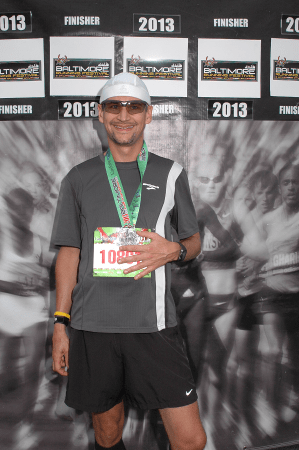 my first marathon in 2015. Thanks for reading!